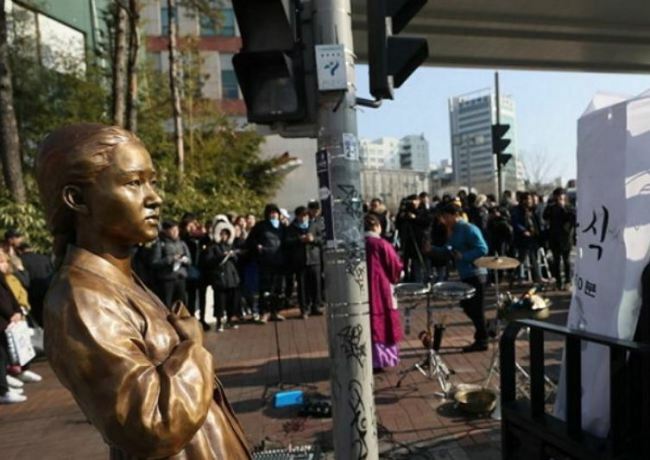 The installation of a “comfort women” statue in front of a university in Seoul was thwarted right before the unveiling ceremony on Thursday, as the university and students protested its installation. Seoul’s Mapo District Council planned to place a comfort women statue in front of Hongik University on the 99th anniversary of the March 1 Independence Movement of 1919, but they failed after students and faculty members from the school stopped the forklift truck carrying the statue from proceeding further. Officially called “Statue of Peace,” the first statue of a young girl was placed near the Japanese Embassy in 2011 to honor the victims of the military sexual slavery by Japan during World War II. Hongik University had expressed opposition earlier, citing concerns that installing a statue that is resisted by nationals from a specific country runs counter to the school’s efforts to promote globalization. They also dispatched some 20 faculty members starting Wednesday to block the installation. The students also criticized the installation committee for locating the statue without proper consent from the school members, but said they do hope to place the statue near their campus. “It is right for the statue to be installed and we do support the plan, but there are concerns that it will interrupt the students’ learning space,” the General Student Council of the university said in a press conference. “We do not agree with the school that it cannot be installed because of the Japanese students. We regret the school’s attitude of neglecting the history,” it added. Considering the narrow and crowded road in front of the school’s entrance and how rallies and protests are often held in front of these statues, the student council said it will conduct a survey to find the right location for the statue, around the school campus. “We will conduct a survey to gather opinions on where would be the best location for the statue and make sure it is implemented accordingly,” the council said. The Mapo installation committee had sought to set up the statue at the historic site of a former Japanese officer’s quarter in Sangamdong, Mapo, but failed after facing backlash from the residents there. The city committee said it will reconsider the right location after gathering consent from the students, residents and the local council. It said it will host the unveiling ceremony on April 13, the date that marks the establishment of a provisional government in Shanghai in 1919. On Thursday, several other statues were installed across the country, including Dongducheon in Gyeonggi Province, Boryeong in South Chungcheong Province and Gumi in North Gyeongsang Province. Meanwhile, the Japanese government reportedly requested South Korea to remove the statue of peace placed in the March 1 Movement Commemoration Park in Gangreung, Gangwon Province. According to Japanese news outlet Sankei Simbun on Friday, the Embassy of Japan in Korea has asked the Foreign Ministry here to remove the statue as it violates the 2015 deal between the two countries, apparently conscious of the PyeongChang Paralympic Games that will be hosted from March 9 to 18 in the same province. The monument in Gangreung was located there on Aug. 15 in 2015, in celebration of the 70th anniversary of National Liberation Day.